This vintage ROLEX VICTORY is a WW2 era watch that was sold to soldiers in CANADA going overseas in WW2 and is a completely original example. The hard-to-find BLACK dial is original, as are the hands and all the lume. The Sterling silver case has been left in its original condition, which is very uncommon. These dark marks on the case is the Sterling silver case PATINA-left original…as found. There are no major case dings. These (smaller sized) 29.3mm. cases were made by either PIONEER or ID. Some steel case backs are signed ROLEX, and others, such as this example are (correctly) not signed ROLEX, but completely ORIGINAL Rolex Victory contract cases. The original ROLEX movement is correctly signed “ROLEX” under the dial and was just cleaned by our ROLEX watchmaker and running accurately. 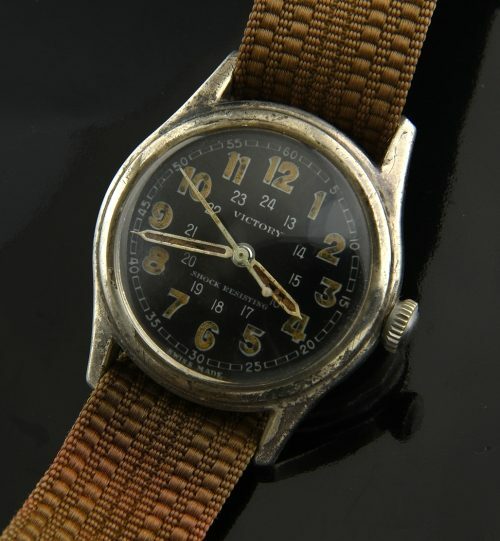 This watch is for the purist, who enjoys their collectable WW2 watches in their original condition-which is becoming hard to find these days. Even the nylon band is quite old and was found attached to the watch when purchased from the estate. This particular dial, with large luminous is the best looking and hardest variation to find. Even the high domed crystal is still present on this watch.